At isolation flanges / joints in the event of a lightning strike on to any above ground pipework or connected structure, or an electrical fault causing a voltage surge on the pipe, a flash-over across the insulating components to the flange could occur. 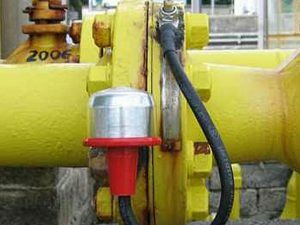 Potential hazards caused by such an incident due to the possible presence of an explosive atmosphere, can be avoided by the use of an explosion-proof surge arrester. The surge arrester is connected in a parallel across the insulating flange.